I made this recipe a month ago when the peaches were delicious and juicy, now you get the last peaches of the season…bye bye my sweet fruit. This dessert reminds me of my childhood…during the summer months when I used to go in town with my mom, we would sit down sur la terrace d’un cafe in Place Stanislas, and watch people walk by indulging with one of those ice cream desserts. Life could not get any better and sweeter. Peche Melba was one of my favorite ice cream cups (coupes de glace), along with Chocolat Liegeois and Poire Belle Helene. It’s fairly simple, you only need excellent ingredients. The dessert was created in 1893 by Auguste Escoffier for the Opera Singer Nellie Melba, that’s where it got its name. 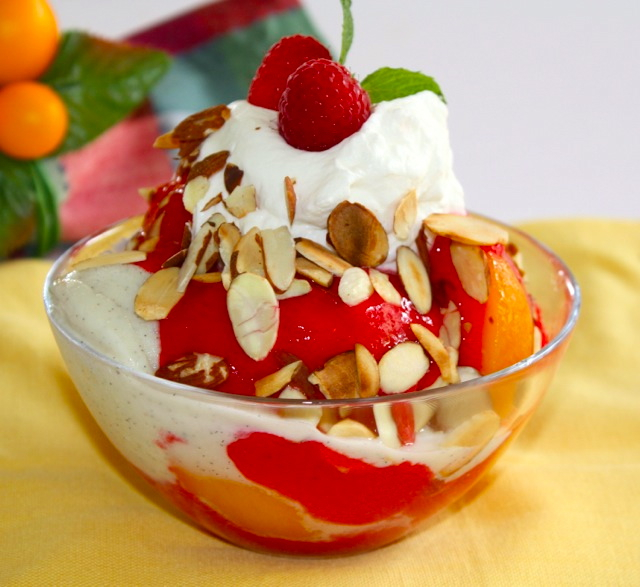 It’s simply a peach poached in a syrup served with vanilla ice cream, raspberry coulis and toasted almonds. It’s a great dessert to serve when you have 6-8 guests and that you don’t want to start getting into complicated desserts. Since it’s still peach season with peaches sweet and juicy, this would be the right dessert to enjoy right now. I bought tons of peaches, so it looks like this will be on the menu for the next week or so. No complaints. Start preparing the syrup, mix all ingredients together. Stir well to dissolve the sugar.poach peaches at slow heat until tender but that can keep their shape. Remove from syrup and peel the peaches. Let them cool and place in the refrigerator until cold. For the raspberry coulis, mix raspberries, lemon juice and 3 tb sugar, cook for about 5 -7 minutes. Blend and strain to remove seeds. This entry was posted by silvia on September 18, 2013 at 4:06 am, and is filed under Desserts. Follow any responses to this post through RSS 2.0.You can leave a response or trackback from your own site.